Draft: 2004, Anaheim Angels, 27th rd. Full name is Martín Valdes Maldonado…first name is pronounced: Mar-TEEN…resides in Toa Alta, Puerto Rico with wife, Janelise, and daughter, Anaiah Mila...Graduated from Dr. Juan J. Nunez High School in Puerto Rico...In January of 2013 and 2014, hosted a carnival for kids on Three Kings Day in Nagubo, P.R….hosted over 250 children in 2013 and 300 in 2014...Played for Puerto Rico in the 2013 World Baseball Classic. games) and Houston (41 games), after being acquired by the Astros on July 26 in exchange for LHP Patrick Sandoval and international bonus pool money…made a combined 111 starts behind the plate, which ranked third in the American League...Ranked second among Major League backstops in caught stealing percentage (45.5%), throwing out 15- of-33 would-be basestealers, trailing only Salvador Perez (47.1%)…threw out 5-of-8 runners attempting to steal (62.5%) in his 41 games with Houston...Hit .333/.355/.542 (24-for-72) with six doubles, three homers and 12 RBI in the month of May, his highest career average in a calendar month (min. 75 plate appearances)...Batted .280/.317/.430 (26-for-93) with runners in scoring position, which included going 3-for-10 with the bases loaded…collected 14 RBI during the month of June, matching his highest total of any calendar month (June 2012) in his Major League career...Made his second consecutive Opening Day start with the Angels, going 3-for-5 with a double and an RBI at Oakland on March 29…became the third Halos catcher to record three hits on Opening Day, joining Lance Parrish (1991) and Tom Satriano (1969)... Finished a single shy of hitting for the cycle on Aug. 19 at Oakland, going 3-for-4 with a solo homer…his triple marked the third of his career and first since June 23, 2017 at Boston…became the first Major League catcher to record a double, triple and homer in the same game since Jarrod Saltalamacchia did so on Sept. 12, 2012 with Boston... Also finished a triple shy of hitting for the cycle on Aug. 22 at Seattle, going 3-for-5 with three RBI. In seventh Major League season and first with the Angels, set new career highs in hits, runs, doubles, home runs, RBI and games played ... Led the Majors in games caught (137 G)...The 137 games were tied for seventh in franchise history and most since Bob Boone's 144 in 1986 ... 95 hits and 14 home runs both marked the most by an Angels catcher since Mike Napoli's 104 H/14 HR in 2009 ... Won first career Rawlings Gold Glove Award...Joined Bob Boone (1982, 1986, 1987 & 1988) and Bengie Molina (2002 & 2003) as the only players in franchise history to win the award as a catcher...Also named Wilson's Defensive Player of the Year at catcher...Defensively, led American League backstops with a .998 fielding percentage, a 38.7 caught stealing percentage (min. 100 G) and was tied for the lead with 22 catcher caught stealing (Yan Gomes)...The .998 fielding percentage was the second-best mark by a Halo catcher in franchise history (Bengie Molina, .999 in 2002) while his 38.7% caught stealing was the best showing by a Halo backstop since Bengie Molina in 2003 (44.4%) ... Finished second in the American League with 19 hit by pitch...Second-most HBP by an A.L. catcher since 1974, trailing only Jason Kendall's 20 HBP with the A's in 2005. In sixth season with the Brewers, ti ed a career high with eight home runs and set new career highs in walks (35) and OBP (.332)...Threw out 34.8% of would-be base stealers (16 CS/46 SBA), which was good for second in the Nati onal League (min. 500 inn.) and sixth overall in the Majors...Milwaukee pitchers fashioned a 3.91 ERA (559 IP - 243 ER) with him behind the plate, good for seventh in the N.L., compared to a 4.18 ERA (875.1 IP - 407 ER) with all other Brewer backstops. Batted .210 with 4 HR and 22 RBI in 79 games…Made 66 starts, all at catcher.....the team went 25-41 in his starts behind the plate…The team posted a 4.03 ERA when he caught (602.2ip, 270er).....overall team ERA was 4.28…Threw out 17 of 46 runners attempting to steal (37%), including 6 of his last 10 (60%)…Started 33 of 38 games from 4/21-5/31 while Jonathan Lucroy was on the disabled list…Started 19 of the team's last 24 games as Jonathan Lucroy recovered from a concussion…Produced a walk-off RBI-single in the 11th inning of the 3-2 Mother's Day victory on 5/10 vs. Chicago-NL.....his mother, Jeanette, was in attendance (see photo below) as he went 3-for-5 with a run, home run and 2 RBI in the contest…Belted his first career walk-off homer with a solo shot off Vidal Nuño on 5/31 vs. Arizona to give the team a 7-6, 17-inning win.....notched a career-high 3 runs in that contest and tied his career high with 4 hits (4-for-6, 3r, 2 doubles, HR, 2rbi, 2bb-1ibb).....became the first player in Major League history to hit a walk-off homer while playing an entire game of at least 17 innings at catcher.....tied the latest walk-off homer in franchise history (Dave May, 5/15/73 vs. Cle)…Following the season played for Mayaguez in the Puerto Rican Winter League. In his first full season in the Major Leagues batted .169 with 4 HR and 22 RBI in 67 games...Made his first career Opening Day roster...Made 47 starts (40g at C, 7g at 1B)...The team posted a 3.17 ERA when he caught (366.2ip, 129er).....overall team ERA was 3.84...Threw out 8 of 27 runners attempting to steal (29.6%)...Represented Team Puerto Rico in the World Baseball Classic (5g, 0-for-9, 2bb)...Following the season played for Mayaguez in the Puerto Rican Winter League and batted .271 with 1 HR and 11 RBI in 28 games. Began the year at Triple-A Nashville, where he batted .198 with 4 HR and 13 RBI in 35 games. Was recalled by Milwaukee on 5/29, taking the roster spot of catcher Jonathan Lucroy (DL). Appeared in 78 games with the Brewers, including 58 starts at catcher ... the team was 10 games over .500 when he started (34-24, .586). The team had a 3.87 ERA when he caught (537.1ip, 231er). Threw out 12 of 44 runners attempting to steal (27.3%). Made his ﬁrst Major League start on 5/29 at Los Angeles and notched his ﬁrst big league hit with a single off Nathan Eovaldi ... he and Mike Fiers became the ﬁrst catcher/pitcher combo in franchise history to each make their ﬁrst Major League starts in the same game (won, 2-1). Recorded his ﬁrst Major League homer on 6/3 vs. Pittsburgh with a solo shot off Juan Cruz. Hit a 2-run homer in the top of the ninth inning on 6/15 at Minnesota off Matt Capps to snap a 3-3 tie and give the Brewers a 5-3 win. Produced a career-high 4 hits in the 10-7 win on 7/13 vs. Pittsburgh, going 4-for-5 with a run and his ﬁrst career stolen base. Belted his ﬁrst career grand slam on 10/2 vs. San Diego off Anthony Bass ... the home run provided the only runs in a 4-3 victory. Was selected to the Team Puerto Rico provisional roster for the 2013 World Baseball Classic. March 11, 2019 Kansas City Royals signed free agent C Martin Maldonado. 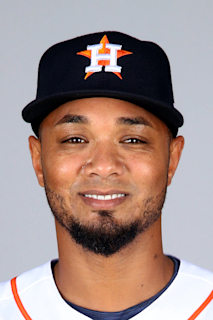 October 29, 2018 C Martin Maldonado elected free agency. May 8, 2018 Los Angeles Angels activated C Martin Maldonado from the bereavement list. May 4, 2018 Los Angeles Angels placed C Martin Maldonado on the bereavement list. October 30, 2014 C Martin Maldonado assigned to Indios de Mayaguez. October 30, 2014 Indios de Mayaguez activated C Martin Maldonado. October 30, 2014 Indios de Mayaguez placed C Martin Maldonado on the reserve list. January 29, 2014 C Martin Maldonado assigned to Puerto Rico. October 31, 2013 C Martin Maldonado assigned to Indios de Mayaguez. October 31, 2013 Martin Maldonado roster status changed by Indios de Mayaguez. November 7, 2012 C Martin Maldonado assigned to Indios de Mayaguez. May 29, 2012 Milwaukee Brewers recalled C Martin Maldonado from Nashville Sounds. March 29, 2012 Milwaukee Brewers optioned Martin Maldonado to Nashville Sounds. November 4, 2011 C Martin Maldonado assigned to Indios de Mayaguez. November 4, 2011 Martin Maldonado roster status changed by Indios de Mayaguez. October 17, 2011 Martin Maldonado roster status changed by Milwaukee Brewers. October 1, 2011 Milwaukee Brewers reassigned C Martin Maldonado to the minor leagues. September 1, 2011 Milwaukee Brewers recalled Martin Maldonado from Nashville Sounds. September 1, 2011 Milwaukee Brewers activated C Martin Maldonado. July 27, 2011 Martin Maldonado assigned to Nashville Sounds from Huntsville Stars. April 24, 2011 Martin Maldonado assigned to Huntsville Stars from Nashville Sounds. March 25, 2011 Milwaukee Brewers optioned Martin Maldonado to Nashville Sounds. January 5, 2011 C Martin Maldonado assigned to Toros del Este. November 2, 2010 Milwaukee Brewers selected the contract of Martin Maldonado from Nashville Sounds. October 22, 2010 C Martin Maldonado assigned to Indios de Mayaguez. July 16, 2010 Martin Maldonado roster status changed by Nashville Sounds. June 26, 2010 Nashville Sounds placed C Martin Maldonado on the 7-day disabled list. June 1, 2010 C Martin Maldonado assigned to Nashville Sounds from Huntsville Stars. April 21, 2010 Martin Maldonado assigned to Huntsville Stars from Brevard County Manatees. February 1, 2010 C Martin Maldonado assigned to Puerto Rico. January 16, 2010 Milwaukee Brewers invited non-roster C Martin Maldonado to spring training. November 11, 2009 C Martin Maldonado assigned to Indios de Mayaguez. July 13, 2009 Martin Maldonado assigned to Brevard County Manatees from Wisconsin Timber Rattlers. July 6, 2009 Martin Maldonado assigned to Wisconsin Timber Rattlers from Nashville Sounds. June 22, 2009 Martin Maldonado assigned to Nashville Sounds from Brevard County Manatees. April 8, 2009 Martin Maldonado assigned to Brevard County Manatees from Huntsville Stars.